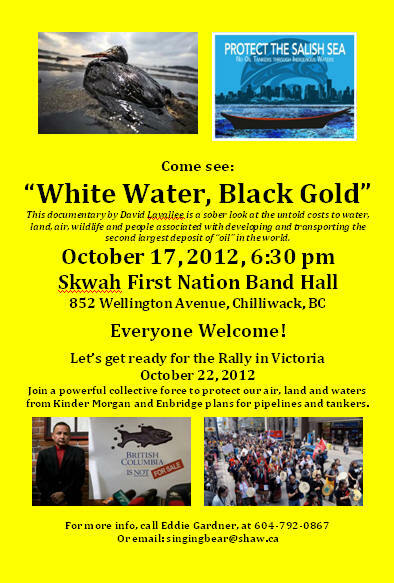 he documentary "White Water Black Gold" that will be shown at the Skwah First Nation Band Hall on October 17 at 6:30 pm. At this meeting, we will discuss the issues related to Kinder Morgan and Enbridge plans to pipe bitumen oil to Vancouver and Kitimat to be loaded on tankers for shipping and the high risks associated with this to the land, air and waters that support our economy, wild-life, human health and well-being. We will also discuss the plans for mobilizing people to the huge rally to take place in Victoria October 22 to show massive support for stopping Enbridge and Kinder Morgan.